Appalachian Voices North Carolina team members join a Moral Monday March in 2017. Today’s decision by the DEQ requiring Duke Energy to excavate all of its six remaining coal ash sites is a testament to the determination of the people living near these toxic sites who have been calling on the state for strong cleanup measures for years. DEQ has finally held Duke accountable for its actions by following the best science to safeguard public health and drinking water. Protecting communities is not a partisan decision, it is a moral obligation. Today, DEQ has taken the right action to truly fulfill its mandate to protect the public’s interest, which is what the public expects state regulators to do in regards to Duke and any other corporation in the state. We will continue to monitor Duke Energy’s actions and ensure that DEQ’s decision is upheld and that all environmental standards are met during the cleanup. 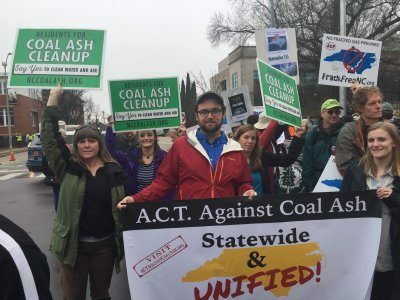 A statement from the ACT Against Coal Ash coalition is available here.